Altun Ha, an ancient site whose name translates to Water of the Rock, is one of the most fascinating destinations in all of mainland Belize. It is believed by historians and archeologists that Altun Ha was first established as early as 900 BC, but it was only rediscovered in the 1960s. Ever since, excavations and tours have helped visitors and students from around the world better understand Mayan history as well as the fascinating culture of Belize as a whole. 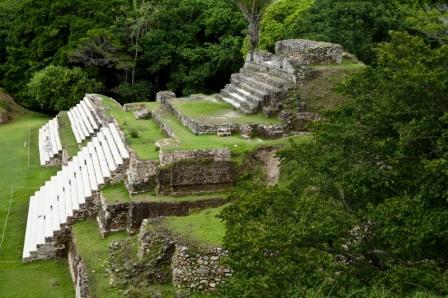 If you're visiting Ambergris Caye or living full time at the Grand Baymen, one of the things you won't want to miss is the chance to take a guided adventure tour to Altun Ha. Altun Ha is an entire city built by the Mayans and located just six miles from the coast of mainland Belize. Occupying roughly five square miles, Altun Ha is made up of more than 500 fascinating structures, each of which has a unique purpose. One of the most famous of these structures is the Temple of the Green Tomb, which is known for what it once held inside. The Temple of the Green Tomb was discovered in the 20 century filled with priceless jade pieces, the most significant of which was a sculpture of the sun god Kinich Ahua's head. Today, that jade piece is tied to the culture of Belize, and it is even featured on the local currency. Unlike other ruins where you can only view structures from afar, Altun Ha offers visitors the chance to enter a pyramid and get close to incredible ruined structures that were once the homes of everyday Mayan citizens. Due to the sprawling size of Altun Ha and its location outside of Ambergris Caye, a guided tour is often the best way to see the ruins. A knowledgeable tour guide can help you make the most of your time in the area and learn as much as possible about the site while simultaneously giving you an insider's perspective. You'll learn about the ancient ceremonies that were held at Altun Ha, what a typical resident's diet would have been 2,000 years ago and why mystery still shrouds the Temple of The Masonry Alters. A guided tour also lets you experience the other great attractions and activities close to Altun Ha, which might include swimming in a freshwater pool, riding horses through the jungle or having a traditional mud bath at an exotic local spa. On a guided tour, you won't have to worry about arranging transport to and from the site of Altun Ha. You can choose tours that depart right from Ambergris Caye or ones that depart from Belize City, depending on your personal preference. From Belize City, Altun Ha is approximately 30 miles north and is close to the Caribbean Sea's coast. Shuttles, buses or vans will take you to attractions along the way as well as Altun Ha itself. When you're in Belize, don't miss out on the chance to enjoy an adventure tour to the ancient Mayan site of Altun Ha. Disover all the wonderful things to do and see while you're in Belize.